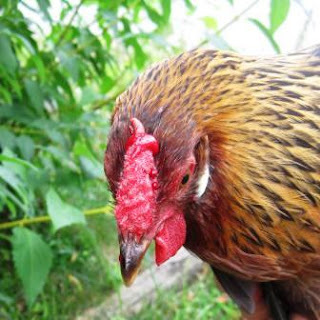 Mooey started as a victim of bullying in the hen house during the long cold winter when the other chickens pecked out her back feathers out of stress and discomfort. This summer, I added five new chickens to the flock -- four pullets who are four months old (like teenagers), and a one-year-old hen. Mooey has made it her business to bully the new young chickens, even though she has been victim herself. This picture was taken after the bleeding stopped. When my husband found Henrietta, her head was bloodied from the pecking and she had flown the coop. The photo with a bloody head is too gruesome to show. I set up a "sick bay" for Henrietta adjacent to the chicken yard with food and water. She evaded capture an spent a night and a day AWOL. The next day Henrietta stayed in her separate pen and I managed to catch her and put her in a small travel crate for the night. The other two nights she roosted in Bob's outdoor lumber shed. On the third day, she tried to push through the door to rejoin the flock, so I let her back in. The hell you know is better than solitary confinement for social animals like chickens and humans. Mooey has become a regular threat in the barnyard. I delivered some stale breakfast cereal yesterday -- a real treat for the birds. 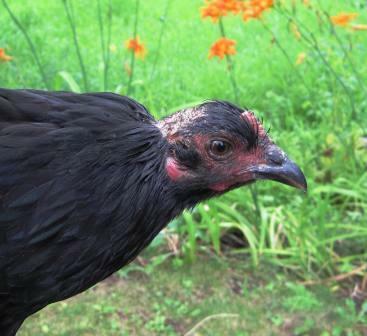 When I gave the young birds a separate helping, Harriet flew away in terror. She was bleeding and panicked. Notice the bit of blood around her comb from brutal bullying. From what I've seen in the barnyard, Mooey is the ringleader of the attacks. She makes it her business to peck at the younger chickens for no good reason. The environment has become so caustic in the barnyard that I'm considering starting over with a new flock of chickens.